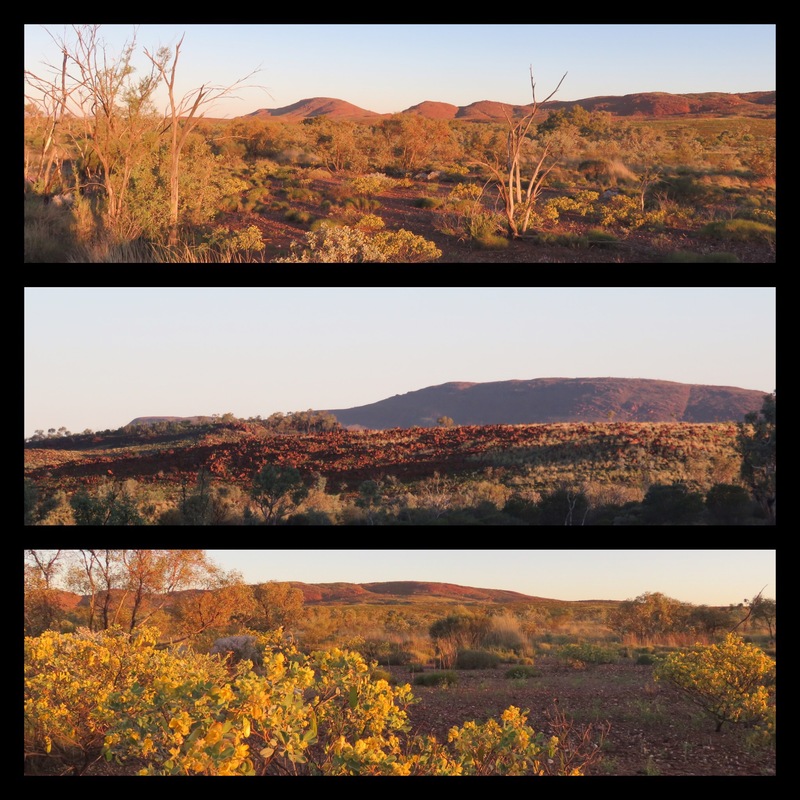 The drive from Nanuturra to Tom Price was probably one of the best I’ve ever seen. Everyone should do it, with Copperhead Road playing. Turn it UP. 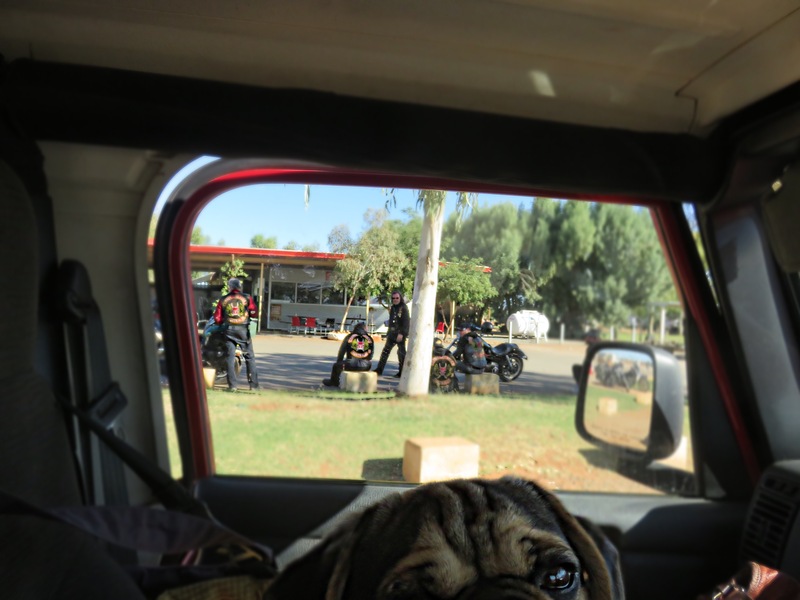 Bravely rescued Zeus from being kidnapped by bikies, inadvertently became IT advisor in the process. Met these adorable creatures in the Short Order Local coffee van in Exmouth and wanted to pack them up and bring them with me. Left blinker on the Jeep has died. Given it was a major fiasco to get get the right blinker repaired, I’ve no idea how long it will be that I will not be able to turn left. The vehicular version of Zoolander. Remember the toe stubbing of Quobba Station? Yeah. That’s not good. Considering amputation. Departing Exmouth, we felt like a new envoy. Clean car, clean dog, mostly clean clothes, it was good. I had intended to stay at Giralia station (not Giardia, the evil protozoan which causes horrific stomach upset when ingested.) However it was a very short drive from Exmouth and when I turned into the station, the homestead looked lovely but was deserted. I later discovered this was a good thing as Joy and Colin, who I met at the eventual evening rest spot, told me it was fairly underwhelming. On the far side of the roadworks after an hour of singing along to Alanis Morrisette there was a rest stop which quite literally every man and his dog had turned in to, presumably for a post-40-kmph-for-an-hour stretch. 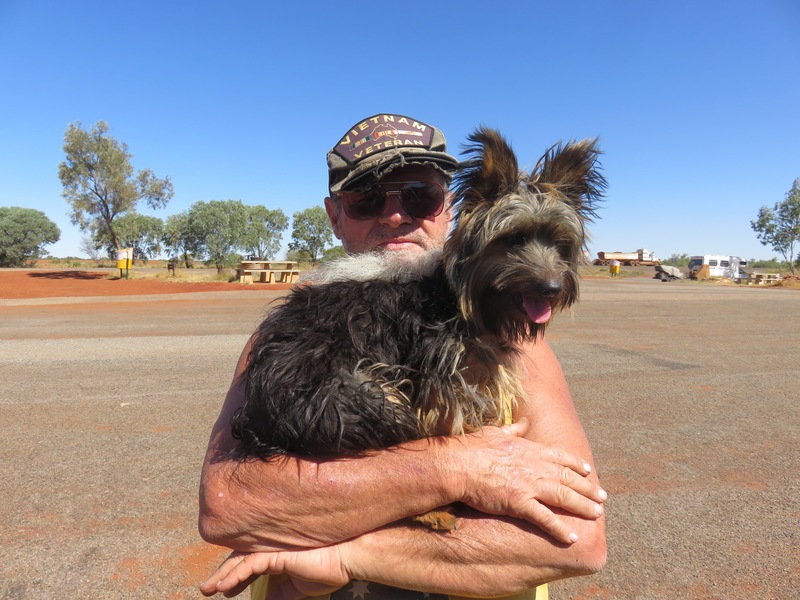 This chap and his dog Newbie (so-called because his previous dog was “D-Bee”) had been at Meentheena, a veteran’s retreat near Marble Bar. I’m annoyed I didn’t catch his name, he had been working to get the solar panelling at the retreat functioning as it had been incorrectly installed. We ended up chatting for some time as his dog was about the same age as Zeus and very keen for a playmate. Unlike Zeus, her recall was AMAZING. To call her, he’d yell a ‘bellow of an old veteran’: “Heeeeeeeaasrghhhhhh get back” and the little silky terrier would bolt across to be with him. Zeus meanwhile trailed behind like a recalcitrant teenager attending a family dinner. She was his second silky terrier – the first had been a lost dog that had hidden under a car in his front yard, and he had eventually adopted it. It was about this time we heard the rumble of serious motorbike engines and a bevy of Harleys topped with Coffin Cheaters belted past. My new friend had run a garage in Rivervale before he retired and spent 15 years travelling around, and had regularly had members of various outlaw motorcycle gangs as patrons at his premesis. “I dreaded the day they all showed up at the same time, but it never happened,” he said. 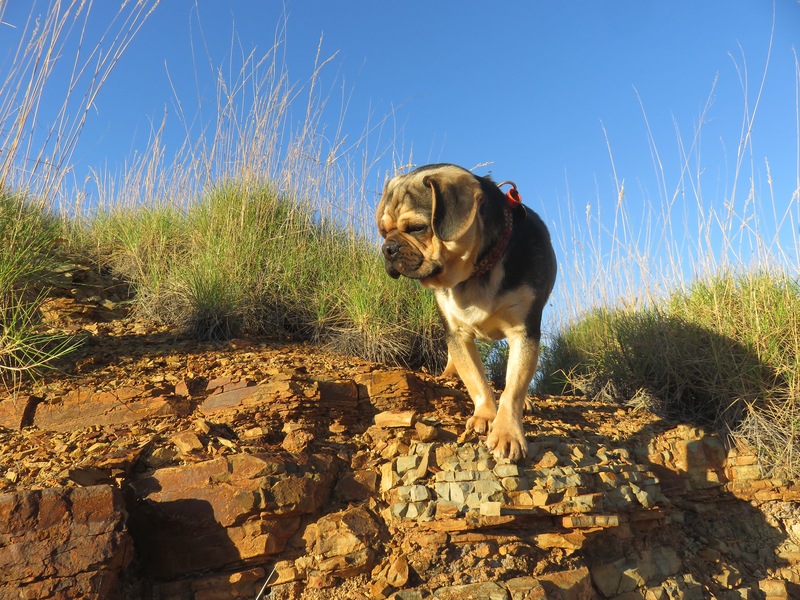 Once I managed to grab Zeus and pug-wrangle him into the car – not before giving some French guys in an old Nissan Patrol some water for the radiator – we bid our farewells as I was heading East and he was heading West – yet to tackle the roadworks. The next stop was the Nanutarra Roadhouse for some semblance of lunch and fuel. I spotted a couple of bikes as I pulled up but didn’t think much of it. Zeus was dead to the world so I pulled him out and set him on some grass for dog business while I fuelled up and found something to eat. Next thing I see is little Zeus wandering into the centre of a mob of bikies – at least 10 – all wearing their Coffin Cheaters patches and gear. 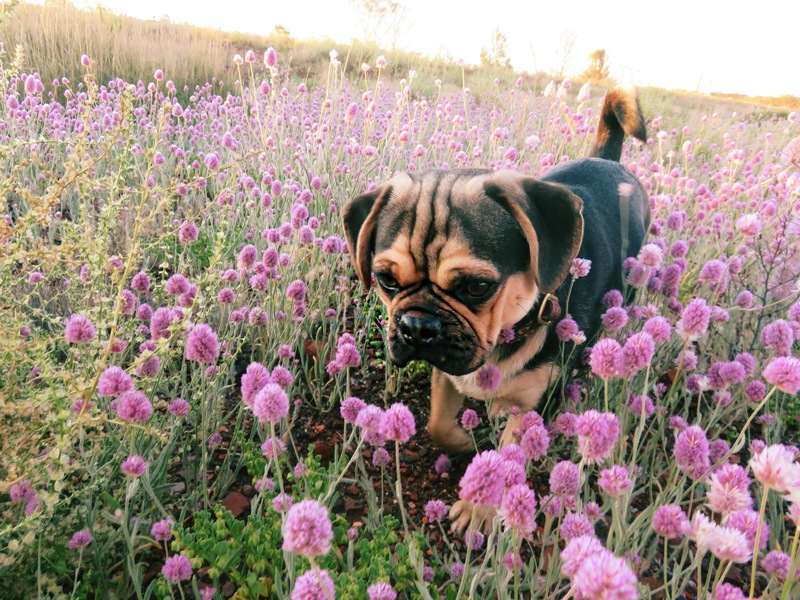 Have decided pugs could solve world peace. Anyway, it was about this time I head them discussing where to camp the night. I can imagine when travelling as a patched-up bikie gang you can’t really just roll in to the next station stay and set up camp. They were heading in the general direction of Fortescue which, thankfully, was north. At this point, they quizzed me on my owns plans. 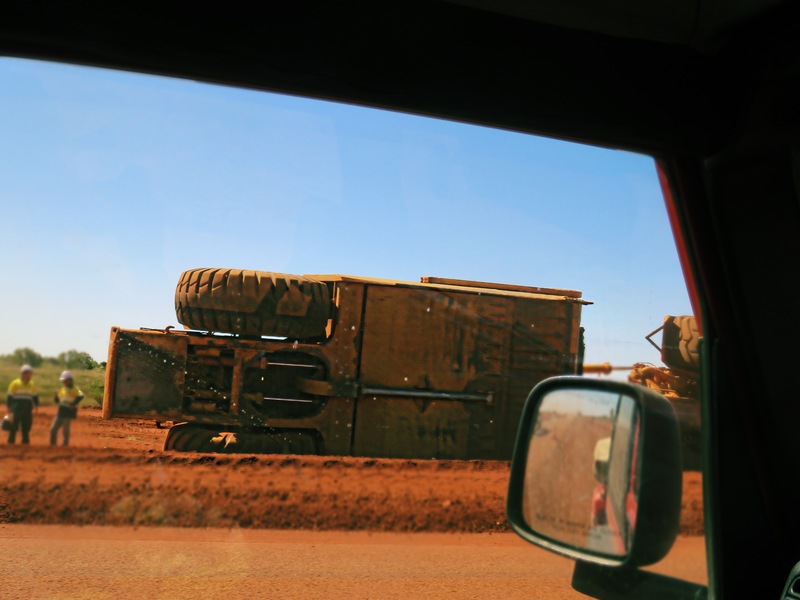 It’s a little scary when a bunch of bikies ask if you’re travelling alone and where you’re staying, so I grabbed out my phone and brought up wikicamps, looking for anything in the exact opposite direction to Fortescue. This prompted more questions: what was the app, and how did it work? I obliged with an explanation and expect the Cheaters may be planning future runs with crowd-sourced social app data. I really wanted to ask if they’d all pose for a pic with Zeus but I chickened out, so surreptitiously took a shot through the window…. Immediately after which my passenger door swung open (you can see it opening in the pic) as I drove because I’d not closed it properly, and as I leant to close it, knocked the car into first rather drive and it let out a huge roar. 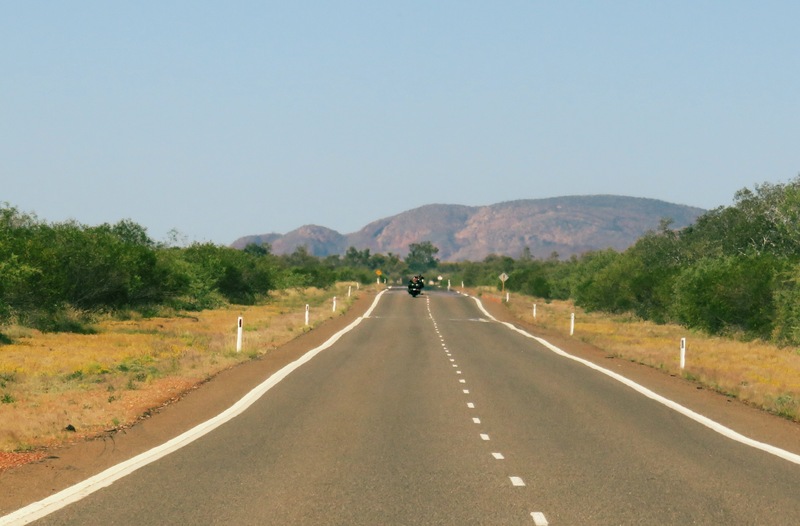 We pushed on through the red hills and the bikies overtook us with a wave, then on to House Creek rest stop, meaning we’d travelled a good five-hour day – our longest so far. Here I met Joy and Colin who are one of the fully self-contained travelling types who steer clear of caravan parks. Their son is a truckie who runs supplies from Perth up to them, including items like a tyre pressure gauge or 5kg of potatoes (the latter of which he’d forgotten, apparently). It was a great rest stop, funded by Mainroads and maintained by Cheela Plains, so quiet and peaceful… Until about 3am when a cacophony of what I think cow moos started up. To his credit, Zeus is now so used to weird things he hardly stirred. I still don’t know what was going on, it sounded like they’d all been herded into a nearby pen and had started wailing together. In to Parabadoo where I saw on the front page of the STimes that two WA Cabinet Minsiters had called it quits, accusing the Premier of making their respective roles untenable. Not missing politics one iota. Then on to Tom Price where it was Sunday. 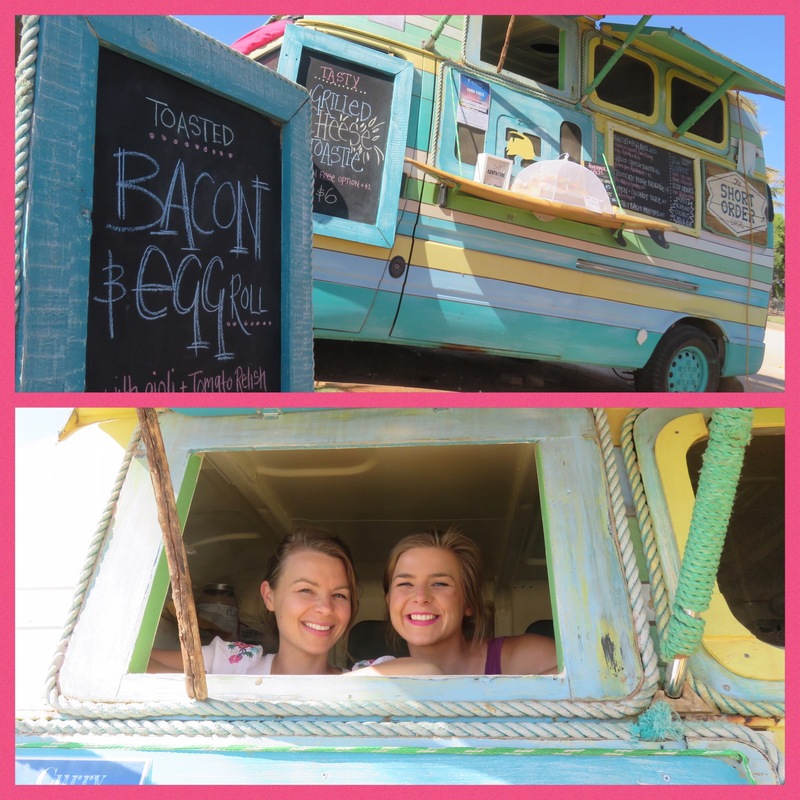 We checked in and set up alongside the throng of Grey Nomads at the caravan park and today were budging around eating chicken lasagne and salted caramel slice before I head to Karijini tomorrow. We did walk up Mount Nameless this morning and will probably drive up it this arvo for sunset. It’s 4WD only but the lady at information used to sell Wranglers for a living and told me I’d have “no problems” getting up. We’ll just see about that. 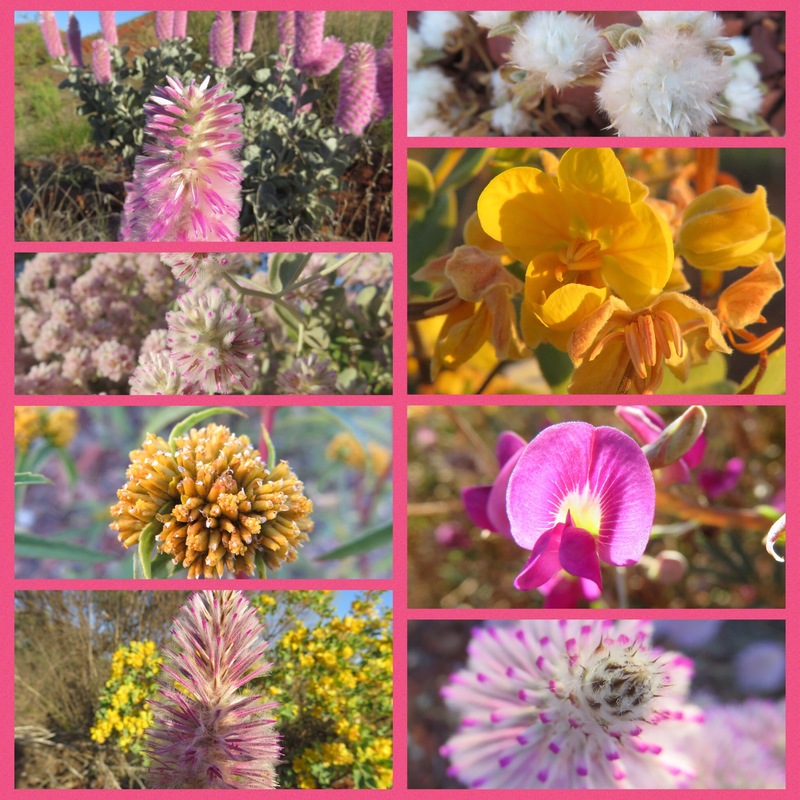 And now, a few pix – flowers of the Pilbara and some shots of our walk up Mount Nameless. 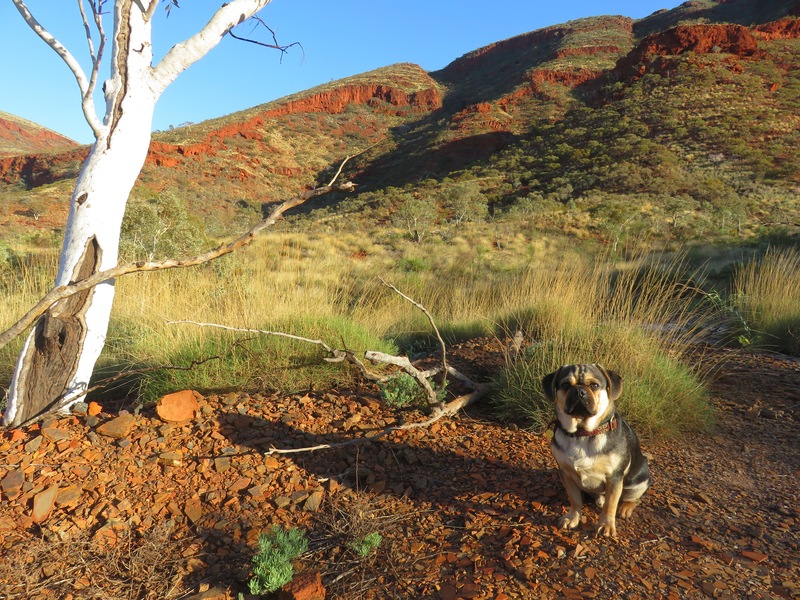 You should do the 4WD track to the summit of Mt Meharry. It’s totally awesome and you can stay overnight (there is a very little plateau at the top. Not quite big enough for your complete set up (maybe just big enough) but the night sky is amazing and you will be alone ;-).